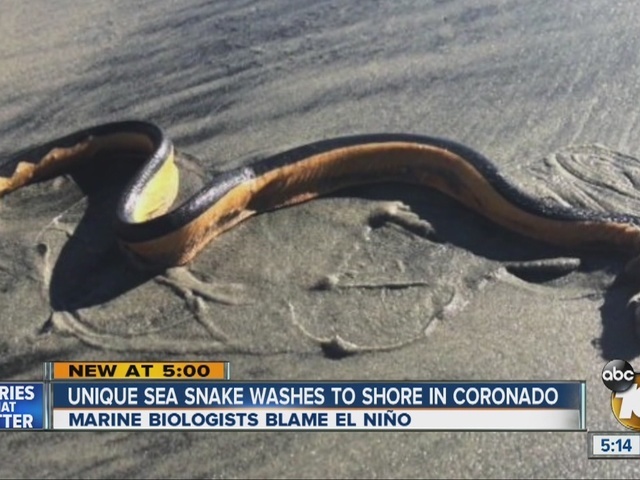 SAN DIEGO – A rare and highly venomous yellow belly sea snake was discovered in Coronado Tuesday. Coronado Lifeguard Capt. Sean Carey responded when a beach visitor reported seeing the snake just south of NAS North Island. "Found the snake just lying on the beach at the water's edge," said Carey. "I've been a lifeguard for 25 years and I've never seen a sea snake on the beach." Coronado Lifeguard Services transferred the snake, which died shortly after it was discovered, to the Scripps Institution of Oceanography for research purposes. Marine biologist Andrew Nosal, Ph.D., confirmed the snake is a yellow belly sea snake. While early reports indicated the snake was a five feet long, Nosal said it was closer to 20 inches. Despite the small size, Nosal said it's still deadly and added they are not native to the waters off San Diego. "The warm water is what brought this snake up," he said. "And the warm water seems to be attributed to El Niño this year." 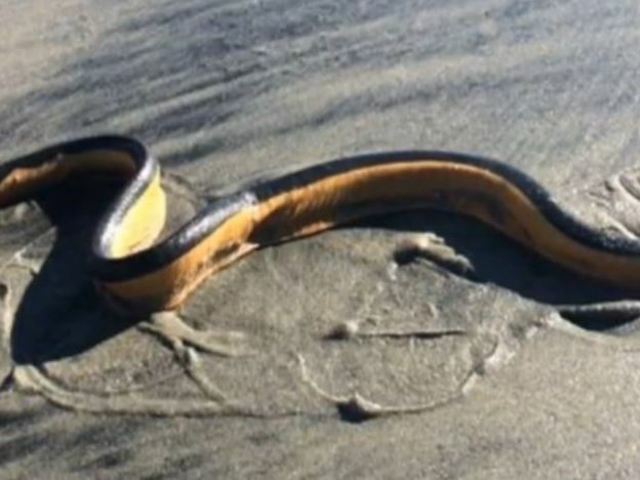 This is the third known yellow belly sea snake to wash ashore in Southern California. According to the Daily Mail , in October, a two-foot-long yellow belly sea snake was found on Silver Strand State Beach in Ventura County. In December, a 27-inch snake was found in Huntington Beach. Yellow belly sea snakes usually live around warm ocean waters, within a few miles of shore, according to CaliforniaHerps.com . Sightings in California are very rare. They are most commonly found on the coasts of Mexico, Africa, Asia, Australia and Central America. They are not aggressive towards people, but if they do bite, their venom can be deadly. "This is one of the most unique things I've seen come up on the beach," said Carey.